I'm slowly working my way through my new haul of vintage Ladybird Books, and this one caught my eye. Harry, like many children, has always been fascinated by dinosaurs and fossils, and so I knew that he'd enjoy looking at this book, even though the actual text is far too complicated for him! Prehistoric Animals and Fossils is from Series 651, a series of natural history books which are definitely aimed at older readers or adults. I've also looked at another book in this series - Plants and How They Grow. It was published in 1974. The book begins with an introduction to fossils, what early people thought about them (perhaps that they had fallen from heaven, or were the remains of animals that had died during Noah's flood). It's only been during the last two hundred years that scientists have really understood what fossils are and how they were formed, fascinating stuff. I learn so much from these books - did you know that the word fossil comes from the Latin word 'fossilis' which means something dug up? The book describes how fossils are formed, the different types of fossil that are found, and has some tips if you want to go fossil hunting yourself. Then it takes us through various periods in Earth's history and the different types of plants and animals that lived in each era. It finishes with some ways to further develop your interest in fossils. I really liked this page about making your own museum for the fossils that you have found. I did something similar with Harry the other week with some small fossils that he has collected from various places, although his wasn't quite as advanced as the example in the book! In this post I'm going into more detail about the felt, ribbon and button purse that I made for Mia, using some ribbon that I received from Fantastic Ribbons. It's really simple to make, and she is loving using it to carry her little treasures around the house while she goes about her role play. I should mention that this isn't a toy and you should always supervise your child while they are using it as the ribbon around the neck could be dangerous. All you need is a piece of felt, some cord or ribbon, some velcro and some buttons. I chose purple felt to go with the pink dotty ribbon and buttons. First work out how large you want the purse to me. Mine measures about 12cm wide by 9cm high. Your felt needs to be three times the height that you want the purse, then cut the top section so that it is shaped like a flat topped triangle. I made a template in paper first to cut out from the felt. Fold up the bottom half of the purse and sew down each side. Then sew the ribbon down each side so that it covers up the sides. I suspect that there is a better way to do it than the way that I did it, possibly involving an iron, I did find it rather fiddly! Then sew in a small piece of velcro so that you can close the purse. For the button embellishment I sewed the buttons onto a piece of felt first, then cut around it. It is sewn over the part of the flap where you could see stitches from the velcro underneath. Finally, measure a long length of ribbon so that the purse will either sit over the recipients tummy or hang to about their waist, then sew in securely at each side. I twisted the ribbon so that the dotty side is always showing. Make sure that it is sewn as firmly as you can, as the purse is bound to be swung about while full! And here's a photo of it in use! I'm sorry that it's a bit blurry, she doesn't stay still for long, and I've cropped out her head because (as usual) her hair desperately needed a good brush! I was recently chosen to review some products from Fantastic Ribbons. Fantastic Ribbons sell a great selection of ribbons, and also many other crafting products like buttons and washi tape. I've never actually bought ribbon before (I scavenge it from boxes of chocolates, clothes and so on) so it was lovely to be able to browse the website and choose some ribbon to use in my crafting. I chose a roll of pretty pink ribbon with dots (5 metres) and some bold cobalt blue side stitch ribbon (4 meters). Each roll cost £2.50, which seems pretty good value to me. I love the colour of the blue ribbon, and I decided to use some to create a simple ribbon bookmark. There are more complicated ways of making these, but all I did was cut a length of the ribbon and secure in a loop at the bottom using a large bead. The bead can then be slid up and down the ribbon to suit books of different sizes. Then I moved onto the pink spotty ribbon. This ribbon really appealed to me, it matches some washi tape that I have! I found this small cardboard box treasure chest on special offer in our local craft shop and painted it pale pink with poster paint. When it was fully dry I used double sided sticky tape to glue the ribbon to the box. Really simple, and it's a great place to keep some of my smaller crafty bits. At the moment it's filled with buttons! I used some of these buttons for my third Fantastic Ribbons craft - a Felt Ribbon Purse. Mia loves playing going to pre-school/going to the shops/going for a picnic games around the house, and she has a variety of bags that she uses to transport everything that she needs. I thought I'd make her a little purse to keep some of her smaller treasures in. (Remember that if you are making this for a small child it's important to supervise them while they are playing with it as it may go around their neck). I cut a long piece of purple felt which is folded over and stitched up the sides. Then some ribbon is added along the sides. It closes with velcro, hidden by a small design made from an offcut of felt and decorated with buttons. 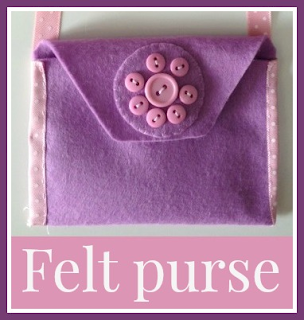 You can find more detailed instructions here - Felt Ribbon Purse. I received the ribbon to make these projects from Fantastic Ribbons. A day at Butlins with Beechdean Scooby Doo Ice cream! We got the summer holidays off to a fantastic start with a day out at Butlins Bognor Regis! It's just down the road from us, but I haven't been since I was a child, so I was delighted to be invited along to try out some new Scooby Doo Ice Creams from Beechdean Ice Cream. We also had the chance to see the Scooby Doo Live show, which is new this season at Butlins. We were greeted by this enormous deckchair, and of course we had to stop and take a photo! Then we had some time to explore. The children were a bit too timid for the rides in the fairground but we had a great time on the smaller rides and the indoor soft play in the Skyline Pavilion. Then we headed for the conference centre to find out more about the new Scooby-Doo ice creams. When we arrived, first we attempted some Scooby Doo themed dressing up to take a "Scooby Selfie". Then there was plenty of ice cream to try! There are three new flavours - Chocolate Snack, Honeycomb Snack and White Chocolate and Strawberry Snack. Of course in the interests of fairness we had to try one of each. My favourite was the Honeycomb, but Mia was quite fond of the White Chocolate! After that it was off to Centre Stage to watch the Scooby-Doo Live show. It was packed inside, but we managed to find seats on the floor near the front. It was quite a relaxed atmosphere fortunately so it didn't matter that the children were a bit restless. Harry loved the show, and although a bit shy at first he was soon shouting along and pointing out the baddies to the cast. Mia was a bit more fidgety though so we only made it through the first half of the show, but we all still enjoyed it very much! Finally we returned to the Skyline Pavilion, and spent some more time on the little rides and soft play. We were all a bit hot and bothered by this point so it was time to head back home, but I'm hoping that we can return to Butlins at some point because I know there was plenty that we didn't have time to see! We were invited along to Butlins by Beechdean and so we received complimentary entry. Did you know that ISAs have changed since the 1st July 2014? At the moment we don't always have a great deal of money left over at the end of the month to put into savings. But when we do, we always put it into our ISAs. It's the obvious place to save money without needing to worry about paying tax on it. Until the 1st July 2014, the maximum amount that could be invested in a cash ISA was £5,940, increasing to £11,880 if you invested the rest into a stocks and shares ISA. However from the 1st July 2014 this all changed. ISAs are now known as New ISAs, or NISAs, and have an increased annual allowance of £15,000, which can be saved either entirely in cash, in stocks and shares, or in any combination of the two. Existing ISAs will change to NISAs, and any contributions made since 6th April 2014 will count towards the 2014-15 allowance. In theory this is great news because it offers opportunities for larger tax free savings. But Scottish Friendly has warned that savers need to be wary of automatically holding all their ISA funds in cash and instead to consider the alternatives that are available. The reason for this is that banks and building societies have already started lowering their interest rates, rates that are already low, in anticipation of the NISA launch, and it's important to think about whether savers that invest all their money in cash are really receiving the best deal. “For every one investment ISA taken out, three cash ISAs are opened. “Cash is easier to understand as it offers security and access to the savings without penalty that investment ISAs do not. People are being put off by what they think is pure equity investments and instead are opting for accounts that offer poor returns on their cash. “The changes introduced in the budget gave savers a glimmer of hope and incentivised people to put more money aside each month. However, the Cash ISA market has not risen to the opportunity, instead choosing to offer low rates of interest on cash ISAs and in some cases actually reducing their rates for fear of overly high inflows”. I must admit that we've only ever invested money in a cash ISA. Like many people, we want the security that the cash ISA offers, and we all know that with a stocks and shares ISA the value of an investment can go down as well as up. But if you are prepared to look at the long-term picture when it comes to savings, there are ways of investing that will still mean that your savings are secure. This is a sponsored post in collaboration with Scottish Friendly. You may have noticed my absence from Ladybird Tuesday lately. This wasn't because I had lost interest. The truth was that I'd actually worked my way through my meagre collection of Ladybird books, and hadn't had the opportunity to search for any more! I've been finding the really vintage ones that I love harder and harder to track down, and when I did find them I couldn't really justify the cost. We were visiting my husband's parents and they had retrieved three boxes of old books from their loft for him to go through. Well, as you can imagine, I was in Ladybird book heaven. I was so excited to see books that went with books I already had, and so pleased to find so many books that Harry will be able to read and enjoy now and that both children will be able to read and refer to as they grow up. It was so difficult to choose one to start with for this week. In the end I chose Stories of Special Days and Customs. It was published in 1972 and is from Series 644. This series only contains two books, and I wrote about the other one a few months back - The Stories of our Christmas Customs. I'm quite chuffed that I've managed to complete a series! Stories of Special Days and Customs takes us through a variety of special days which are celebrated throughout the year. They are the occasions that we celebrate in this country and are mainly based around the Christian calender, but it also covers days like April Fools Day and Bonfire Night. It's actually a really good reference book to have around, as I really enjoy doing seasonal crafts and activities with the children. A page is devoted to each special day, accompanied by a gorgeous picture. Some are of people celebrating the day itself, others are of some of the Gods and Goddesses or historical figures that are the reason for the celebration. In the introduction, the book boldly states that the most important anniversary in the year is Christmas, although this may just be because they have inserted a plug for the Christmas Customs book. Once again the Ladybird book manages to present plenty of information in an easy to read and understand fashion. I learned a great deal from reading this book, especially about how the pre-Christian festivals were adopted by the church. The children will learn about and celebrate a lot of these occasions at their school, and it will be nice to be able to share this book together at those times. I love crafting with felt and buttons (see my felt and button embroidery hoop art here! ), and having recently come into possession of a lovely new silver frame that I picked up in our local craft shop on the school run, I made this little button tree picture with a patterned fabric background. I bought the frame in our local framing and stitching shop, they usually have a box outside with small frames for £1 each. It has no glass or backing to it, but that's fine for this project. You can easily buy cheap frames from Ikea or the large supermarkets. The first thing to do is to plan the design for the button tree on paper by drawing around the frame and creating an outline for your picture. You also need to choose the buttons that you want to use and plan where they will be positioned. I decided to stick to round buttons in the same colour, but I found loads of inspiration on Pinterest with all different shapes and colour of button. When your design is completed, take a photograph that you can refer to later as you sew on the buttons. Cut a piece of thick card to the same size as the frame. Then cut out the background fabric a couple of centimetres larger than the card. Iron if necessary. Use your paper drawing to trace templates for the felt pieces (the trunk and leaves) and cut them out. My one tip for cutting felt - buy some decent, sharp scissors and only use them for cutting felt and other fabric to keep them sharp. Use pins to secure the template to the felt when cutting. The tree trunk shape was quite fiddly to cut, I found it easiest to cut a little outside the template, and then neaten up once the paper template was removed. Using the frame as a guide, position the felt pieces on the background fabric and secure in place with some small dots of fabric glue. Don't use to much as it will make it harder to sew through the fabric later. Then stitch around the trunk and leaves. I used contrasting colours and large stitches because that's the way I roll, you could match the colours so that the stitches aren't visible. Then it's time to sew on the buttons. You don't need to be as diligent as you do for buttons sewn onto clothes. Make sure that the buttons are all the same way up and decide how you want to align the centre holes, I went for random directions. I stuck pretty closely to my original design, but I did make a couple of changes. Then you need to mount the fabric design onto your piece of cardboard. Check the positioning carefully, then fold over the edges and secure them with some long stitches across the back. Sew down the corners for extra security. Then I found that my picture just rested neatly in the frame. If you have a more substantial frame you'll have a backing to hold it into place. I think it works better without glass as it's such a three dimensional piece. Here's the final piece! 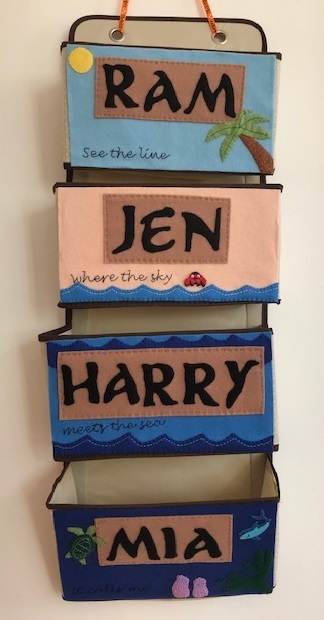 I loved it so much that I went on to make a second button felt picture which you can see here - Brown and pink felt button tree picture. They both look great hung up on the wall just above my desk! I've been meaning to make fairy wands for a while. Mia loves dressing up in her princess and fairy costumes, and by calling it a magic wand I was able to interest Harry in the craft too! They are great for imaginative play, and with the streamers they look fab when they are being waved around. 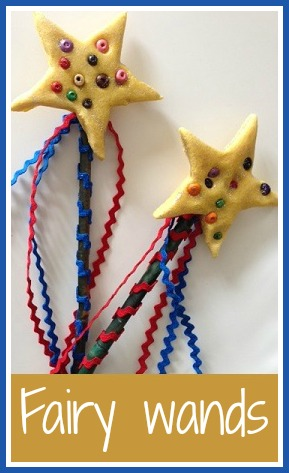 These pretty salt dough wands with their ric rac streamers are perfect for waving and twirling about. They take a few days to make as you need to wait for the different parts to dry, so you need to work on them in stages. Each wand is made with a stick of bamboo from the garden, cut to about 30cm and with the ends sanded smooth. 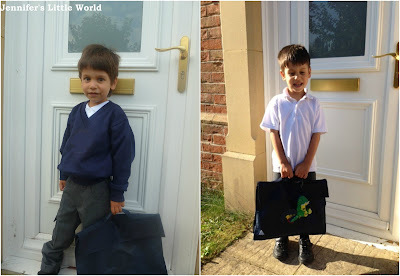 I decorated the entire length of each one with coloured ric rac. The easiest way that I found to do this was to secure one end of the ric rac to the end of stick with tape, and then paint a line of fabric glue along the side of stick. Twirl the stick on one end while you feed out the ric rac so that it covers round, then secure at the other end with tape. Leave to dry. 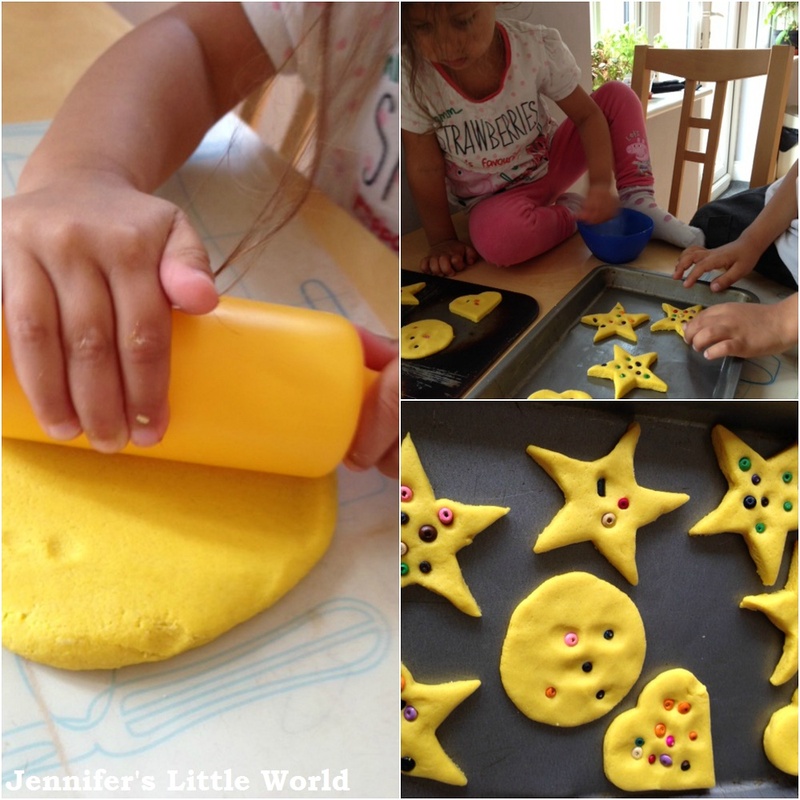 The toppers for the wands are made with salt dough. I used a very basic recipe - two parts of plain flour to one part salt, with a few drops of yellow food colouring and enough water to mix it to a dough. I used a heaped tablespoon as my part measure and it made enough for about eight toppers. I sorted out some small wooden beads for the children to use to decorate the salt dough. I've seen enough crafts on Pinterest using melted plastic beads to be wary of using plastic beads in the oven! Then we made up the salt dough and cut out shapes, placed them on a baking tray and pressed in the beads. This amount of salt dough made enough for about eight shapes, so the children could choose their favourite when they were dry. When it came to baking the salt dough, I kept a very close eye on the oven and checked them at ten minute intervals, as I was a bit wary about burning the beads. In the end I baked it at a low heat (100C) for just over an hour, turning the salt dough half way through, and it was absolutely fine. Then I kept the salt dough pieces in the warm airing cupboard for a few days to make sure that they were thoroughly dried out and also placed them on a sunny windowsill. When they were dry I painted them with some silver glitter paint which makes them really shiny and sparkly. 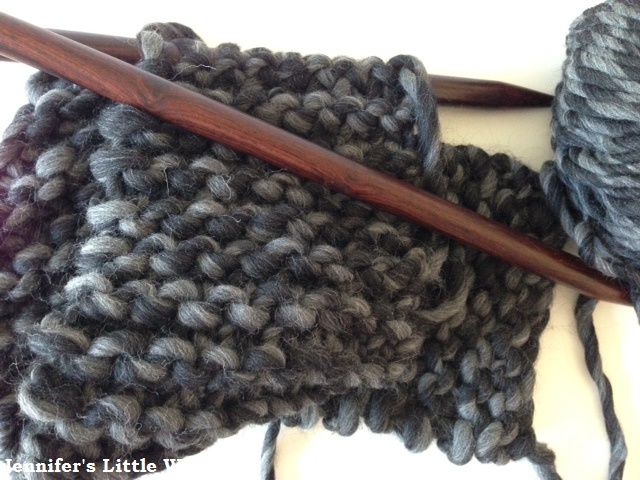 I cut some long lengths of ric rac to make streamers for the wand. The salt dough pieces are quite heavy, and so I chose to use Sugru to attach them to the top of sticks. I reviewed Sugru recently and was very impressed at how well it stuck different materials together. I used one 5g pack of yellow Sugru which was enough to stick both the salt dough and the long pieces of ric rac firmly to the stick. If you don't have any Sugru then you'd need to use some very strong glue, and perhaps tape the pieces of ric rac to the stick first. When the Sugru or glue has dried, the wands are ready to be played with! Children can invent all sorts of role play games, and these wands should be sturdy enough to last for a good amount of time. 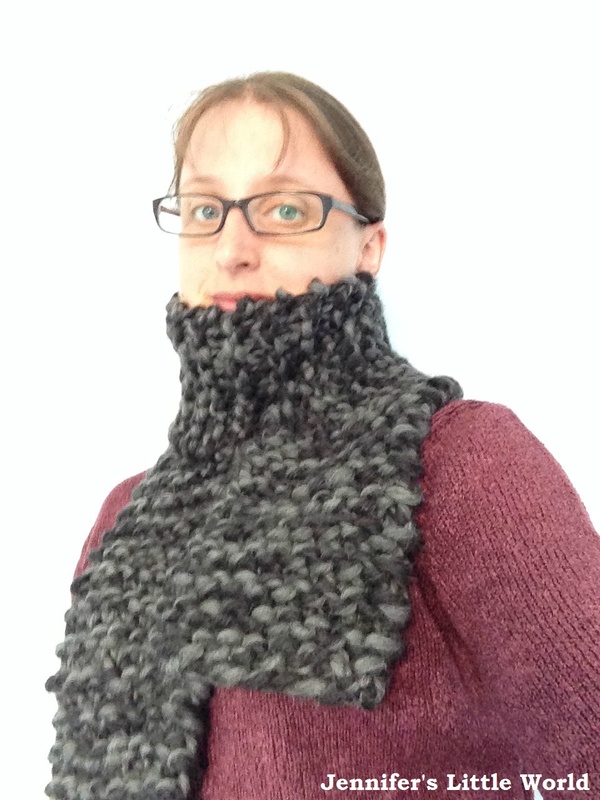 The beads and ric rac that I used for this project were part of a review bundle from The Bead and Button Company.